Cultural Compulsive Disorder: A Double Dose Of Double O.... 7 That Is!!! A Double Dose Of Double O.... 7 That Is!!! James Bond is one of my favorite properties. I love the movies, the original books, and everything else that comes along with Britain's favorite super spy. Yesterday I came across two awesome Bond related items that I just had to share with my CCD brethren. First up is a video (courtesy of Akbar5656) of every time someone says 'double o' in the history of James Bond films. Even though this super cut video may only be 1:14 long, it sure does have a lot of different characters uttering the famous catchphrase. 193 to be exact!!! 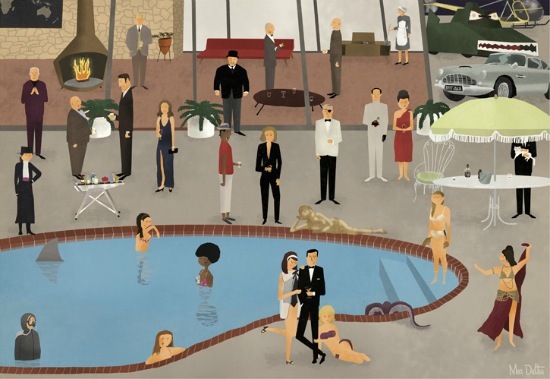 Next we have a 50th anniversary art piece courtesy of Max Dalton that has a very 60s feel to it. It is very Mad Men-esque to me. All Hail James Bond... click after the jump for both.